Because of its numerous health benefits, I’m trying to add more barley to our diet. 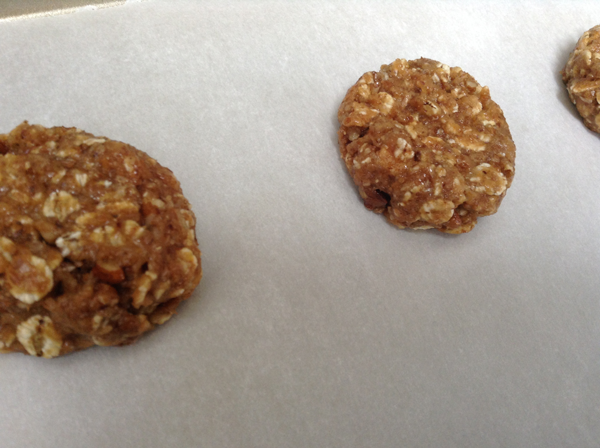 For cookies like these, I would normally use rolled oats, but instead I reached for my big jar of barley flakes. It terms of look, texture, and taste, I find the barley flakes similar to oats. We’re also trying to cut way back on our sugar consumption, so these cookies aren’t very sweet, but that’s not to say they’re medicinal. They are still quite a satisfying little treat. If you think you might want a sweeter cookie, bake one, and add more sweetener or cinnamon if desired. *Or 1/2 cup of one of the two fats. 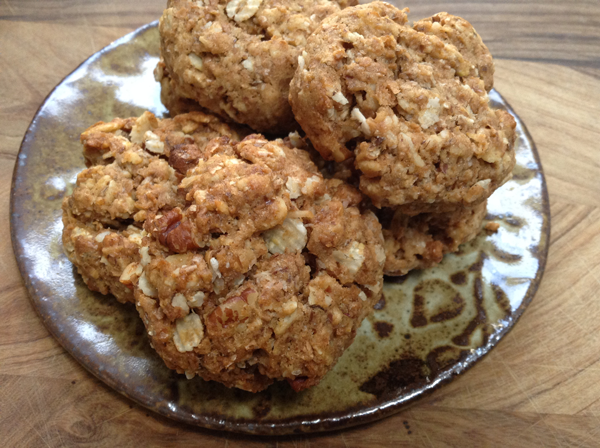 In a bowl, mix together the barley flakes, wheat flour, sugar, pecans, coconut, flax meal, baking powder, cinnamon and salt. Stir until everything is well combined. Add the oil, margarine, milk and egg to the dry ingredients and stir to combine. This isn’t a particularly wet dough, so make sure to work the wet into the dry so that no streaks of the dry ingredients remain. Line a baking sheet with parchment paper. Using about 1 tablespoon of dough per cookie, roll into balls–compressing as you go–and place on the baking sheet and press down with the tines of a fork. Bake for about 12 minutes until the cookies are starting to brown. Cool and store in an airtight container.